Last year was Jack Kirby’s 100th birthday and we still don’t have the awesome biopic for him that we deserve. So I figured I could make one up — and instead of a simple biopic, it would be a biographical mini-series, going through different eras in Jack’s life. This eight-part mini-series will chart the life and career of Jack “King” Kirby (played as a young man by Joseph Gordon-Levitt, as an adult by Liev Schrieber, and as an old man by Judd Hirsch), the creator and co-creator of Captain America, the Avengers, the X-Men, and many, many others, from his partnership with Joe Simon (Joshua Molina), to his marriage to Rosalind “Roz” Goldstein (Lizzy Caplan), to creating most of the Marvel universe with Stan Lee (played as a young man by Ben Schwartz and as an adult by Marc Maron), and everything that came after. Kirby quits Eisner & Iger and joins Fox Comics, where he meets Joe Simon. Together, they go to Timely Comics and create Captain America, but their relationship with Timely sours quickly and they move on to National Periodical. Meanwhile, Jack and his girlfriend Roz decide to marry, just before he becomes drafted into World War II. Jack returns from the war and tries to move on. His partnership with Joe provides another boon, as they invent romance comics like Young Romance and Young Love. But their attempts at doing another version of Captain America are soured by the McCarthy hearings. Jack and Joe’s partnership dissolves and Jack tries to earn enough money by working for Timely again — this time, however, they’ve changed their name to Atlas. The head of Atlas, Stan Lee, brings Kirby a new challenge and a great opportunity, soon rebranding the company as “Marvel.” The episode ends with the publication of Fantastic Four #1. Jack enjoys great success as one of the architects of the Marvel Universe, but as time goes on, his concerns over the unequal partnership with Stan grows. Jack tries to branch out and write his own stuff, but a bad contract dispute forces him to quit and move on to DC Comics. Kirby’s entry into DC Comics creates shockwaves, but he is given the editorial freedom that he wants...or so he thinks. When the initial “Fourth World” books fail to sell, Jack is forced to give up on his creations and try something that will sell. Finally, after four years, he gives up and goes back to Marvel. Kirby tries more experimentation with his stories, creating the Eternals and dabbling with an adaptation of 2001: A Space Odyssey and a never-published adaptation of The Prisoner. But nothing brings success and finally Jack decides to leave comics altogether. In 1985, Kirby is hired by DC to make a final graphic novel about the New Gods, but things don’t go as planned. Marvel offers to return some original artwork, but for a price. 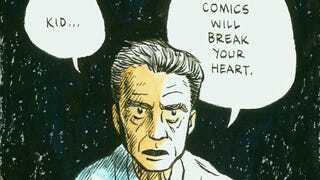 And in the end, Kirby reflects on a life made up of comics, of superheroes, and of grand space sagas.